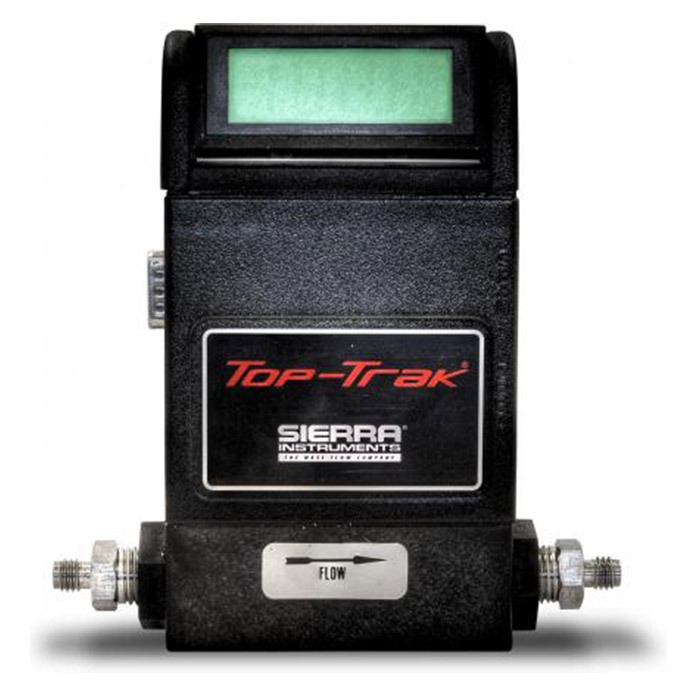 Our TopTrak® MFM directly measures the mass flow rate of gases in flow ranges from 0-10 sccm up to 0-50 slpm. The Model 822 and Model 824 are for measurement of air and ALL inert gases & mixtures. Both models serve a wide range of inert gas flow applications including process control, flow research, instrument OEMs, gas panels, and cell culture maintenance. In addition, both models offer standard 0-5 VDC or 4-20mA output signals. Our Model 822 is equipped with a large tiltable LCD readout available in your choice of engineering units. The LCD readout can be mounted on the instrument or on a remote panel. Our Model 824 is a compact OEM configuration that comes without the LCD readout. Sierra’s Platinum Sensor Technology to eliminate zero-drift and create excellent long-term reliability is utilized in the design of both Models. The operating principle of Top-Trak transducers is based on heat transfer and the first law of thermodynamics. During operation process gas enters the instrument’s flow body and divides into two flow paths, one through the sensor tube, the other through the laminar flow element bypass. The laminar flow bypass generates a pressure drop, P1–P2, forcing a small fraction of the total flow to pass through the sensor tube (m1). Two resistance temperature detector (RTD) coils around the sensor tube direct a constant amount of heat (H) into the gas stream. In actual operation, the gas mass flow carries heat from the upstream coil to the downstream coil. The resulting temperature difference (?T) is detected by the RTD coils and gives the output signal. Since the molecules of the gas carry away the heat, the output signal is linearly proportional to gas mass flow.